Jamie-Lee Curtis, a queen in her own right, has just made the internet love her even more than we thought possible by recreating one of the iconic memes of the decade. Back in the good old days of 2010, Jamie Lee Curtis was probably having a bad day when the paparazzi showed up to snap a few off-guard photos of her and her friend out for lunch on Venice Beach, California. 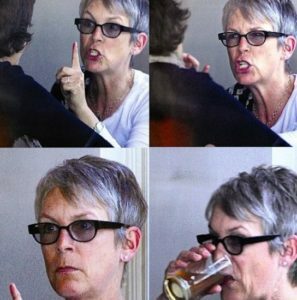 This may be one of the only moments I would praise the negligence of privacy taken by paparazzi as then we would have never been graced with this comedy gold that is Jamie Lee Curtis shouting at her friend during a disagreement. The photo in question shows JLC in a heated debate with a friend over some lunch, along with some mouth flexing and finger wagging that sure enough went viral as soon as the internet got their hands on it. Curtis staged the recreation of the meme over the weekend to promote the latest episode in a YouTube series called 'Game Grumps' where she plays Mario Kart party with her son and guest-hosts with Dan Avidan and Hanson. Whatever about the YouTube series, but now we have a hilarious recreation of one of our all-time favourite, celebrities memes. Twitter users have been going crazy over her latest stint, praising her as an icon and thanking her for this meme gold.